We would like to take a moment of your time to express our deep appreciation for helping us to reach our golden 50th anniversary. 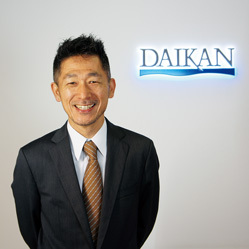 In 1964, Daikan, which was a family business, started to manufacture plastic-cut letters. Then during the next several years we expanded our product line from not only signboard but also to acrylic interior goods and furniture. After the Oil Shock, we developed our copper-chiseled sign, and it was successful giving us a chance to change our strategy from manufacturing acrylic signboards to manufacturing metal signs. During the Japanese economic boom years, we grew and became one of the leading total sign manufacturers in Japan. After the bubble economy burst, we enthusiastically kept on developing our new products and tried to sell them, however it was tough going for several years. But at long last, in the early 2000s we developed our ABS resin sign letters, Taff Lite Sign® and D-Letter®, which opened a whole new door into the sign industry in which we were able to build up a totally new category, and ever since these new sign letters have been growing in popularity all over the world. At about the same time LEDs were introduced into our industry as a new technical sign material and began taking the place of other popular products. Subsequently we developed our own LED signs which were named Lumi Letter®. They are being improved on to this day, and there are now many new variations. Taking a look back on this past half century, we fondly remember the enthusiastic efforts of our predecessors in developing new products and the grateful appreciation from our treasured customers. 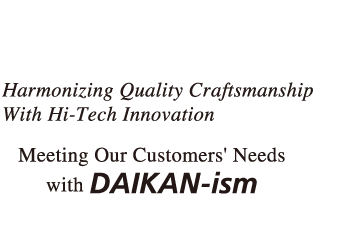 Daikan has always had a strong passion to create original, good-quality, innovative and customer-pleasing signage. And we couldn’t have achieved this without our valued customers who often gave us challenging opportunities to solve difficult specifications. Additionally, we even sometimes learned from our customers ways to improve when our products occasionally didn’t meet their expectations. However, more often than not we were further motivated to reach higher levels when our customers were completely satisfied with their new Daikan signage. We will always have a sincere sense of gratitude and will continue to endeavor to meet our customers’ requests no matter how complicated they may seem to be. We will without fail try to create signage which is in all respects number 1 in the world. Thank you again for your continued cheerful patronage.